Photo: (l-r) College of the Rockies’ Board of Governors Chair, Jesse Nicholas, Lieutenant Governor’s Medal recipient, Skyla Gronen, and Governor General’s Bronze Medal and President’s Award of Excellence recipient, Bradley Schmidt joined College President and CEO David Walls at the June 8 Convocation ceremony. College of the Rockies’ President and CEO, David Walls, presided over the College’s 42nd convocation ceremony on Friday, June 8. After a welcome from Acting Vice President, Heather Hepworth and an inspiring speech by student representative Bradley Schmidt, President Walls addressed graduates, speaking about the College’s mission to transform lives and enrich communities through the power of education. “We see the power of the single mother who has sacrificed time with her children in order to offer them a better life, we see the power in the youth who are the first in their families to complete a post-secondary credential, and we see the power in the student who travelled half way around the world to study in another language and experience a different culture,” Walls said. Jesse Nicholas, Chair of the College’s Board of Governors then assisted with the presentation of academic medals. Skyla Gronen was awarded the Lieutenant Governor’s Medal while Bradley Schmidt was the recipient of both the Governor General’s Bronze Medal and the President’s Award of Excellence. The Lieutenant Governor’s Medal is awarded to a student who has excelled in a vocational or career program and who contributed in a positive way to life at the College. Skyla Gronen, a graduate of the Hairstylist program, is from the Creston Valley and found her passion for hairstyling at an early age. She looks forward to pursuing her career in the hairstylist field now that she has graduated. 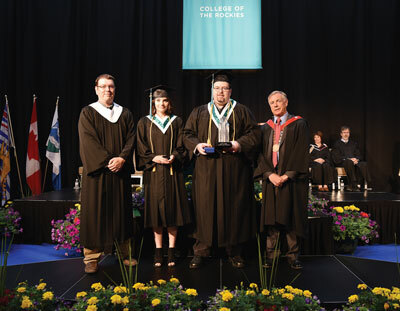 The Governor General’s Bronze Medal is awarded to the student who has achieved the highest academic standing upon graduation from a two-year diploma or associate degree program. The President’s Award of Excellence is presented to a first- or second-year student, planning to complete a four-year degree at the College or elsewhere, who has achieved the highest cumulative grade-point-average. Bradley Schmidt graduated from the Business Administration Accounting diploma program with a grade-point-average of 9.95 out of 10. Also raised in Creston, Bradley plans to pursue his Bachelor of Business Administration degree at the College before eventually earning his Chartered Professional Accountant designation. To date, College of the Rockies has awarded 546 certificates, diplomas and/or degrees to students in the 2017/18 academic year with the potential for 210 additional credentials being awarded as more programs wrap up in June. One hundred fifty-two graduates were able to attend the June 8th ceremony.